Sliced Black Summer Truffles...a unique, rare & delicious funghi. The flavors of black summer truffles are complex. Sliced black summer truffles work best in delicately flavored dishes & should be used sparingly! Sliced black summer truffles are delicious in soups & sauces. 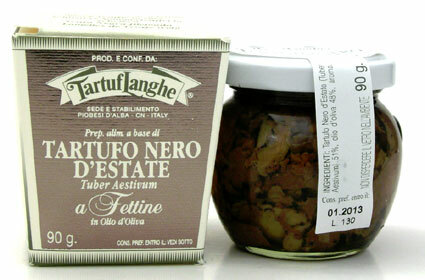 Saute sliced black summer truffles in white wine or champagne for flavoring cream style sauces. These thin slices of black summer truffles are preserved in extra virgin olive oil...Enjoy!